What style of ring band is best for me? Which is the right ring band for me? This is a question that often crops up; especially with wedding rings which ideally we'd like to be wearing for a very long time. When it comes to choosing a ring, be it a stacking ring, or a wedding band there are a number of band styles to choose from. Below is a description of the main styles of band I offer, but please be aware that on the website not all of the band styles are listed for each ring. This is purely because there are so many options I couldn't add them all on to my system! It just doesn't allow for that number of variation; so do get in touch and I will advise you of any cost differences and how to order 😊. What is a D-shaped band? Stacking ring set with smooth and textured D shaped bands. Before I start I should say that all of the bands are circular. I think I sometimes confuse people when I start talking about D shaped bands but what i'm talking about here is the shape of the cross section of the band not the band itself which is most definitely circular. So the D shaped band is the band shape I most often use, and which is listed for most of my stacking rings. You can see an example in the picture above. Some D shaped bands in different sizes. So what is a D-shaped band? This is a real classic. It's flat on the inside and curved on the outside. If you were to cut the band, the edge of it would like a bit like a capital letter D. This curve adds a satisfying weight to the ring, and it's profile often means that is sits well with an engagement ring. This style is flat on the edges but has a gentle curve on both the inside and the outside of the band. This makes it really comfortable both to wear and to take off. Apparently this ring profile is especially good to get over knuckles and sit more comfortably. Another classic shape. This flat band is straight on the inside and outside, no doming here at all! Now this is probably a bit more obvious; the band profile is flat on both sides (see pic above), so in this case, the cross section would be rectangular. I think a slim flat band is especially good for people who aren't used to wearing rings, or who find them uncomfortble sitting against other fingers. It's a bit like wearing flip flops, you get used to it pretty quickly, but for some people it's just never feels right. This (for me) is just the reverse of the D shape band. So in this case it has the contemporary look of the flat band on the outer edge, but the rounded side is on the inside, making it super comfy to wear and take on and off. Obviously I couldn't not include a round profile ring on here too. These rings are made from round silver or gold wire. 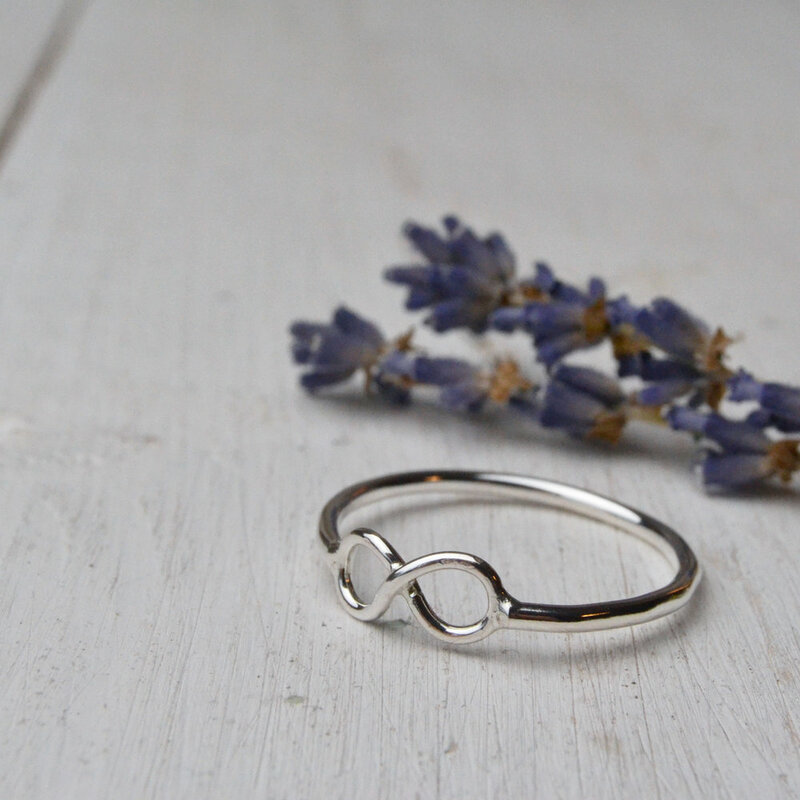 They are best suited to smaller rings, up to about 2mm to sit comfortably on the hand next to other fingers. I do love round profile rings as slim stackers.